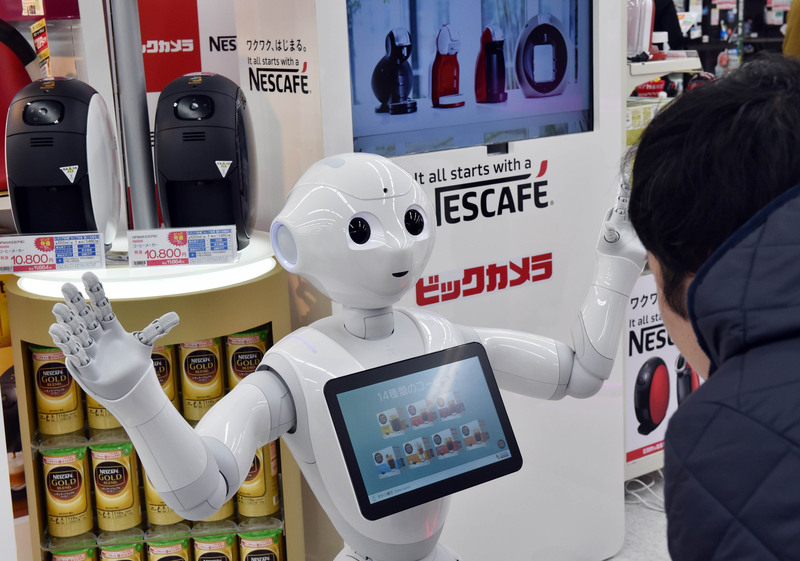 Nestle will call upon a fleet of Pepper androids made by SoftBank to help sell coffee machines in its Japanese retail stores. Pepper will "help us discover consumer needs through conversations between our customers and Pepper," Nestle and SoftBank said in a joint statement. SoftBank has received up to 400 inquiries from other companies regarding the Pepper robot, as additional sales announcements are expected in the future. The 4-foot-tall robot is able to predict human emotions based on facial expressions, dance, make jokes, and communicate with customers. Each device retails for around $1,900 - plus additional monthly fees. SoftBank already is deployed in its retail Japanese phone stores, helping gauge customer opinions.